The highly anticipated Bollywood movie ‘Ek Ladki Ko Dekha Toh Aisa Laga’ finally released on February 1st 2019. After the release of the trailer. many Bollywood fans were left feeling intrigued. There was a lot of speculation surrounding Shelly Chopra Dhar’s Bollywood directorial debut. ‘Ek Ladki Ko Dekha Toh Aisa Laga’ is a love story, however, it breaks the normative narrative of heterosexual love. The flick seeks to educate and engage with the audience, showcasing an LGBT love story. Bollywood has not had the most sensitive portrayal of the LGBT community in the past. With films such as ‘Dostana’ (2008) having largely made light of the issues surrounding the LGBT community. Dhar with co-writer Gazal Dhaliwal crafted a host of characters that the audience can’t help but love and relate to. Each character has that all too human feeling of wanting. Longing for something that is just out of reach; this theme continues throughout the film in multiple characters. The film showcases the struggle of a young woman who lives in a typically conservative Punjabi household. ‘Sweety’ (Sonam Kapoor) is almost doe like in her mannerisms, very delicate, quiet and graceful. It becomes quite clear that ‘Sweety’ has a love interest which is not accepted by her family. While her family members and even the household staff assume it must be a man, ‘Sweety’ is actually struggling with coming out as being a Lesbian to her family. It appears that ‘Sweety’ is set to live an isolated, unfulfilled and closeted life; that is until she meets someone who is willing to be her voice and friend. Rajkumar Rao is truly the definition of an unrequited lover. His character ‘Sahil Mirza’ is a playwright who falls in love with ‘Sweety’ after a whirlwind chance encounter in Delhi. He senses that ‘Sweety’ is drowning, in need of help and as a chivalrous man he makes it his aim to find and help her. This means travelling from the metropolitan city of Delhi to rural Punjab where ‘Sweety’ lives with her family. It’s during this trip that ‘Sweety’ opens up about the truth of her sexuality to ‘Sahil’. Then, from that point a truly heartbreaking tale of struggle, denial and suppression comes to surface. Dhar opted to highlight the struggle throughout ‘Sweety’s’ life. The audience sees her as an adorable young girl who excitedly rushes home to tell her father (Anil Kapoor) about her achievements at school. Then we see her enter her teens, where she first realises that she may not be ‘normal’ and that her love for a female friend wasn’t reciprocated. We see ‘Sweety’ truly in turmoil over the reality of the nature of her feelings versus what she knows is accepted in society. She witnesses her brother bullying and beating a young boy for being gay, and it is that moment that ‘Sweety’ decides she can never be open about her feelings. Throughout the film ‘Sweety’s’ sexuality is referred to as an ‘illness’ or that it is ‘dirty’ and ‘shameful’. These views do sadly reflect many of the attitudes towards the LGBT community within India. The presentation of all these issues is done with such a delicate and subtle approach that the film is truly worth all the praise it has been receiving. The film was written with such an easy and light air. The audience is seen to laugh along with Juhi Chawla’s character ‘Chatro’ who longs to be an actress despite being quite the ham actor. In addition to smiling each time Anil Kapoor’s character ‘Balbir Chaudhary’ creeps into the kitchen to cook, despite his mother’s disapproval of his, ‘girlish hobby’. It’s through these subtle suggestions that the Dhar and Dhaliwal highlight how natural it is to desire something, be it a hobby, profession or a woman. That denying or forbidding a person’s desires only breeds contempt and misery. One of the most moving scenes comes at the climax of the film where Anil Kapoor shines like never before. The raw emotion displayed in a very heart-wrenching father-daughter scene highlighted why Sonam and Anil Kapoor were the only choices for this on-screen pairing. Rajkumar Rao is endearing and earnest in his performance. A vessel of truth; his character holds a mirror up to everyone in this film and even the audience, prompting them to face one simple truth. Love is love, there is no pollution or illness or shame involved in it, it’s simply human nature. The focus point of this movie was to, ‘let love be’ and they certainly drove that message home. Dhar has set out to educate people, not to offend or shock audiences. She is merely changing the perspective with which they usually view love and love stories. The ending of the film felt rather optimistic however, that may have been the point. That we as a society need to learn to embrace people for who they authentically are. This too without the shaming, trauma and violence that has been reported by other members of the Indian LGBT community. 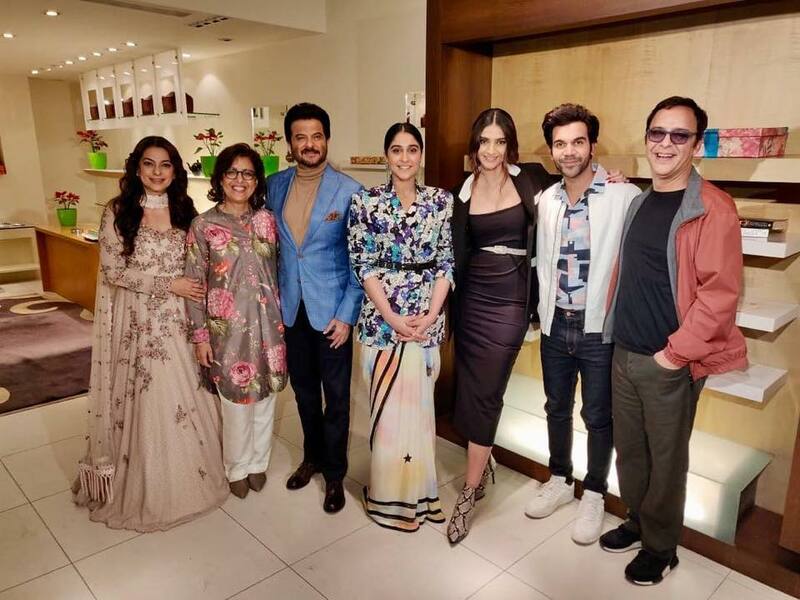 ‘Ek Ladki Ko Dekha’ is the love story Bollywood has needed to see, hopefully this film will open minds and doors for the industry to embrace inclusivity. At its core ‘Ek Ladki Ko Dekha’ is sweet and simple love story of someone who fell in love with a girl they saw. A thoughtful, hopeful and emotional love story. ‘Ek Ladki Ko Dekha’ is most definitely worth the watch, just to witness the magic these actors and storytellers have created.